No need to go to the big bike shows like Eurobike or Interbike, the best bike gear gets rolled out at the Tour de France each year. The 2011 Tour is no exception. Best thing about it is that the inspired riders have the sweetest gear. Thomas Voeckler’s yellow tour Colnago. The inspired frenchman is also sporting the euro hot-pant version of bike knicks. He obviously doesn’t listen to the media that say he’s not a contender and won’t make it to the podium in Paris. Viva le Voeckler. Great detail on the frame with the rooster. One of the strongest images of the 2011 tour was Jonny Hoogerland getting taken out by a media car and put into barbed wire fence. Fortunately for spectators this man feels no pain and got back on his bike with the arse ripped out of his knicks. Jonny has gone on to have a great tour, must be the adrenalin kicking in. Ridley gave his bike the polka dot treatment in honor of his time in the jersey. Sylvain Chavanel is doing his national colours proud, all the way down to his socks. Merckx gave his “La Machine” the once over to match the kit. 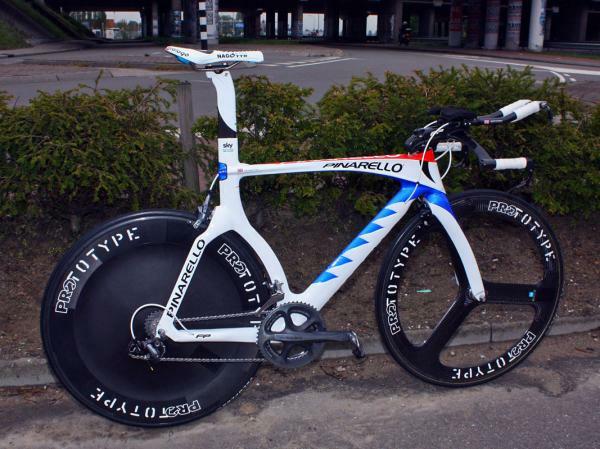 Team Sky Pinarello Graal Time Trial bike complete with teeth or is it some aerodynamic rippling like dimples on a golf ball. Either way it looks quick. Unfortunately we’re not going to get to see Bradley Wiggins give this a crack in this years tour due to the broken collarbone. Trek know that a stylish team like Leopard Trek need a stylish bike. 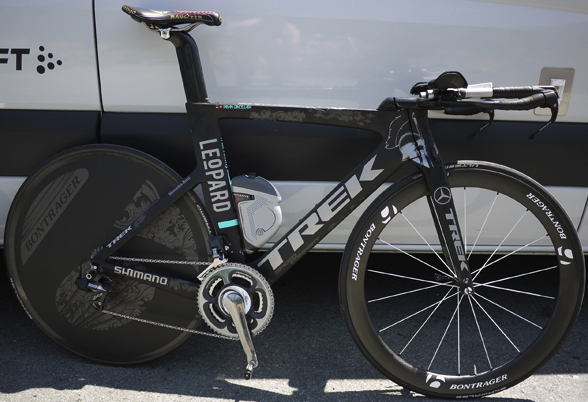 Frank & Andy Schleck have this special edition Trek Madone 6.9. Bet this will be a favourite on Project 1. Not to be out down Fabian Cancellara has his own Spartacus inspired Madone. Looks like a lethal weapon. Adding further bling to Fabian’s Trek is the Yumeya (Dream Workshop) Dura-Ace bolt kit, which is an ultra light set of gear complete with a titanium nitride-coated chain. If you only have 1 product in existence and therefore have to pick 1 rider to use it, Fabian’s the man. That’s right, he is the only man in the peleton to be using Yumeya group set. Fabian Cancellara’s time trial bike has also been given the Spartacus treatment. 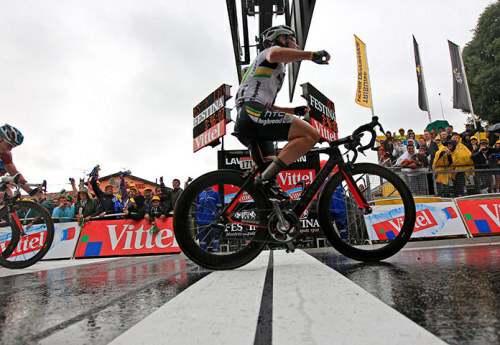 The only way to catch a photo of Mark Cavendish’s Specialized Venge is on the slow mo cam on the finish line. Cavendish is having a cracking tour expertly lead out by the Aussie gun Mark Renshaw. Mark is on the stealth with red trimming. Lovely machine and obviously very fast. Thor Hushovd – The God of Thunder, the current World Champion, wearer of the maillot jaune, winner of 2 stages – he is the man. Thor has been rolling around on the new Cevelo S5. Cervelo’s latest aero road frame complete with aero shrouding over the rear wheel and some nice yellow trimming to do the yellow jersey justice.